The AMD PRO A12-9800B is a mobile mainstream SoC from the Bristol-Ridge APU series for notebooks (7th APU generation), which was announced mid 2016. It is the business version of the AMD FX-9800P and features the same specifications. The PRO A12-9800B is (together with the FX-9800P) the fastest Bristol Ridge APU with a 15-Watt TDP and the successor to the 15-Watt A12-8800B / FX-8800P from the Carrizo generation. The ULV chip has four CPU cores (two Excavator modules = 4 integer and 2 FP units), a Radeon R7 GPU as well as a dual-channel DDR4-1866 memory controller. Carrizo is a full-fledged SoC and is also equipped with an integrated chipset, which provides all I/0 ports. Thanks to higher clocks, the A12-9800B is slightly ahead of the old 15-Watt top model FX-8800P and competes with a Intel Core i3-6100U (Skylake, 15 Watts). Compared to the Intel model, the AMD chip has a small advantage in multi-thread scenarios, but is beaten when you only stress one or two cores. This means there is sufficient performance for typical office and web applications as well as light multitasking. The integrated Radeon R7 (Bristol Ridge) GPU has 512 active shader units (8 compute cores) clocked at up to 758 MHz. Thanks to the better utilization of the clock range as well as faster DDR4-RAm, the GPU can slightly beat its predecessors Radeon R7 (Carrizo) and competes with a dedicated GeForce 920MX in the best-case scenario (dual-channel memory, low CPU requirements). Many games from 2015/2016 can be played smoothly at low settings. 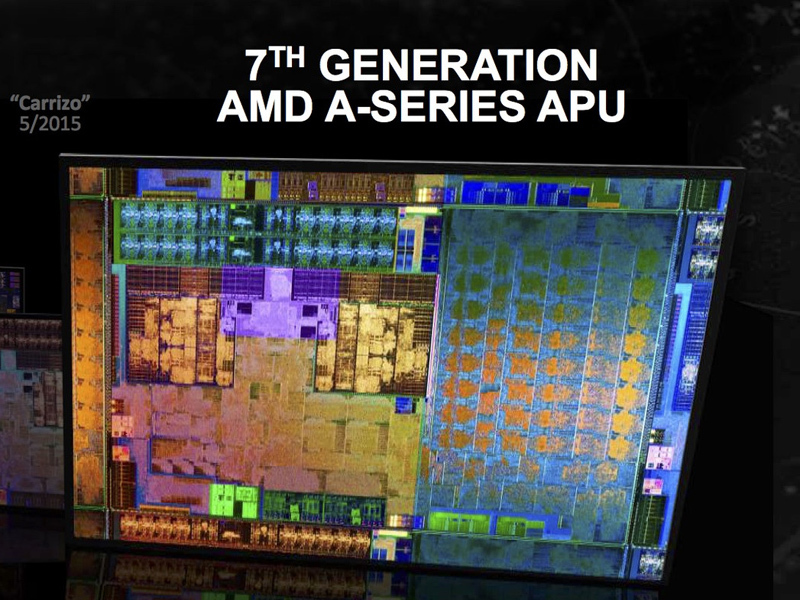 AMD specifies the TDP of the A12-9800B with 12-15 Watts, which is comparable to Intel's ULV models. This means the APU is a good choice for thin notebooks starting with a 12-inch screen.